Metal Building Designs Nigeria - Free Prefab Home Designs. Get Yours Fast! Metal building designs are as diverse as there are people. Unfortunately, not everyone who want to order prefab homes know much about prefab building plans and how to get one. Consequently, we have created a number of functional, appealing, and exotic prefab home designs anyone from anywhere in Nigeria (or the world) can choose from. The goal is to ensure you get your dream prefabricated building as fast as possible. One quick question: What drives our metal building designs? What is the concept behind the prefab home designs presented below? There are a number of factors that influence the nature of designs that appeal to different category of customers. Some potential customers are concerned about cost. So, we have created simple low cost prefab homes and portable cabin designs that get the job done with minimum impact on their tight budget. Some Others want prefab house designs that meet their specific corporate personnel needs. For example, a company may be concerned about providing adequate office space for 30-50 employees. And top management may want the office accommodation closely knitted together for easy interaction while at the same time providing enough space for comfort. In this particular case, the office building design will be driven more by the principles of ergonomics and the number of employees being provided for than by cost. The objective of building design is to create a building plan that shows the relationship of the different parts of the building as it relates to the requirements of the customer. Besides the question of size, metal building designs for residential accommodation also address the question of comfort and privacy. For example, in the good old days in Nigeria, most house plans use to make provision for just one toilet for the entire family. But things have since changed. 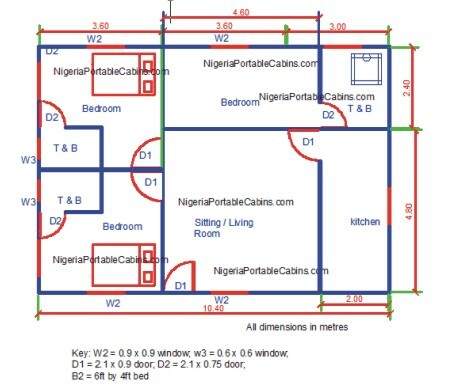 Many modern house plans now incorporate what is called ensuite bedrooms, which means that each bedroom is built to have its own toilet and bathroom. The prefab house designs below will appeal to different customers. And may appeal to you too. However, you're not restricted to these designs. You can order any of the designs below or you can send yours to us. We build to customers' specification. Want to buy a prefab home? P.S: Want a house design different from those shown on this page? No problem. You can get exactly what you want by requesting a custom building design. How do you do that? Simply click HERE to request bungalow floor plans. Alternatively, you can click HERE to request duplex house plans.